Practically everyone's heard of MuscleTech Cell Tech and Nitro Tech - heck who wouldn't have? You see its multi-page, colorful, and extremely hyped advertising in the bodybuilding magazines! In the end, who doesn't by into hype, and jump on the band wagon and buy a tub or two of cell tech? I sure did. That was quite awhile ago, and I did it to see if all the hype holds any substance. MuscleTech is a great maker of supplements, no doubt about it. 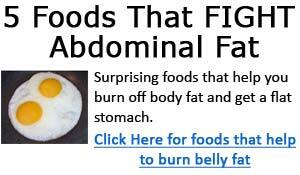 Their fame mainly rides from their best seller Hydroxycut that has helped millions lose fat and weight. And all their other products are nice quality products too, but mostly over priced if you ask me. Of all their supplements, Cell Tech and Nitro Tech are the most hyped and over priced. So, behind all the hype and ridiculous pricing, does cell tech and nitro tech work? Of course they work, you'd be seriously mistaken to think MuscleTech would make something so expensive that doesn't deliver results. I won't go into Nitro Tech in detail here, since we got a review of Nitro Tech here. So many people has bought into the hype of Cell Tech and Nitro Tech (myself included) - so do I think its worth blowing cash on? Not really. This is a 2 part review series of Cell Tech, in quite some detail. A quick little blurb about Cell Tech's taste - it comes in 4 flavors, orange, grape, fruit punch, and lemon lime. I like orange, so that's the one I tried, and the taste is actually really good! For those of you that really care about taste, you should enjoy Cell Tech taste. Most other people who's taken Cell Tech also enjoys the taste. Now on with the good stuff. MuscleTech did put alotta thought into Cell Tech, and its mix of ingredients. CellTech isn't like the pure creatine monohydrate powders, but a mix of a lotta stuff that actually works synergistically together to boost creatine absorption - I'll get into details about this later. It also includes some taurine, L-Alanine, some BCAA's, and also some trace minerals. With all things put aside, the major ingredients in Cell Tech are the 5g of creatine and 49g of carbs. You'll see in the next section how this mix helps creatine absorption. You need to understand some basics of insulin before understanding how dextrose and chromium pico works to boost creatine absorption. Insulin release results from the food you eat, and you have a good control of this by the foods you choose to eat. There are simple carbs, and complex carbs - actually I think there's something like 5 types of carbs like monosachrides, polysacharides, and etc... I dunno them all. To keep things simple, we just say simple and complex carbs. Carbs are just sugar. Simple carbs are just sugar, and is absorbed into the blood stream very fast. Complex carbs like that from rice, bread and pasta, take time to breakdown, and takes longer to absorb. The waxy maize and dextrose are quickly absorbed into your blood stream. When you have all this blood sugar all of a sudden, it triggers a insulin spike in your body, and the insulin pretty much force feeds your muscles with the excess sugar. In the process, creatine gets shoved into the muscles as well. When I bought my Cell Tech, I got a 4lb tub, cuz of price considerations, and damn is it ever expensive!! 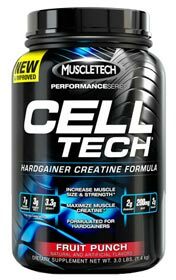 MuscleTech Cell Tech comes in 3lb and 6lb containers. Their prices are at around $35 and $55, respectively. Roughly, a 3lb tub will give you 28 servings, and a 6lb tub will give you 56 servings. Each serving of Cell tech works out to around $1 depending on the size you pick. You can save a good chunk of change buying Cell Tech online, follow the links below.